IF YOU’RE INTERESTED IN A COMBINATION OF THE GREAT OUTDOORS AND A FAST-PACED CITY, DENVER IS THE PLACE FOR YOU. Denver is known as the Arts Capital of the West. 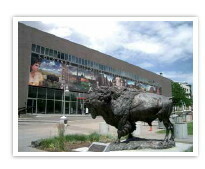 The Denver Art Museum (DAM) is the largest art museum between Kansas City and the West Coast. It’s filled with amazing pieces including classics by Monet, Picasso and Matisse and more modern works by Warhol and O’Keefe, plus intriguing pieces from Africa and pre-Columbian America. Denver’s Museum of Contemporary Art is another great museum.